Shocking Information on Aspartame - Dangerous Neurotoxin! Shocking Information on Aspartame - One of the Most Dangerous Neurotoxins Used Daily Since its Approval in 1981 - "World's Worst Research" included falsified reports from lab animals with tumors and death after consumption of chemicals found in MSG, Aspartame, etc. This video exposes what is considered the "World's Worst Research" which included false reports on lab animals with tumors and death from consumption of chemicals used in msg and aspartame - a huge coverup deemed criminal by the FDA but unprosecuted due to statute of limitations! Now how is it this organization cannot have better controls over their approval process?! And we're consuming this toxic sweetner every day in gallons of diet soda, and other products. Farmers from different states speak out, including the President of the National President of the American National Raw Milk Pricing Association, Joel Grenaw of Kendall, Wisconsin. Click on the photo to view bumper sticker details or order. Also see video about the effects of fluoride on the pineal gland. Via "Millions Against Monsanto": GOOD NEWS - FOUR more Congressmembers have signed on as Co-Sponsors to HR 5577 The Genetically Engineered Food Right to Know Act: Rep Lowey (NY), Rep Hinchey (NY), Rep Maloney (NY) and Rep Sanchez (CA). Please thank them and continue to contact your reps who haven't signed on yet!!! The following is a copy of the letter Congressman, Peter Defazio of Oregon wrote to the mother of one of our friends about the concerns about genetically engineered foods. Please take a moment to write to him and thank him. He is looking out for Oregon as well as the rest of us. Dear Ms. Allen: Thank you for contacting me with concerns about genetically engineered (GE) alfalfa. I completely agree with you and appreciate you writing on this issue. You will be happy to know that I recently wrote a letter to USDA Secretary Vilsack, in which Senator Leahy (D-VT) and 56 of my colleagues joined me in asking that USDA ... See Moreprohibit the use of GE alfalfa. I have long stood up against GE products, particularly during the creation of the national standards for the National Organic Program, which I helped establish. There are numerous reasons to believe that GE contamination will occur among non-GE alfalfa crops and result in significant economic harm to the alfalfa seed and hay export markets and to the organic and conventional dairy industries. Alfalfa seed growers are particularly at risk, and the Pacific Northwest grows more alfalfa seed than anywhere in the country. USDA's recent draft environmental impact statement (DEIS) for GE alfalfa concluded that deregulation of GE alfalfa would have "no significant impact". However, the public comment period of USDA's DEIS received more than 200,000 comments, most of which argued that the USDA findings were grossly inaccurate. Alfalfa is the main feed for dairy cows, so deregulated GE alfalfa that contaminates conventional alfalfa would tremendously impact the dairy industry, especially organic dairy industry which is approximately a $1.4 billion industry. American consumers today expect the USDA certified organic seal to represent products free of GE contamination. If the USDA organic seal no longer represents a GE-free product because of unintended contamination, the integrity of the entire organic industry will be compromised. Furthermore, if farmers are unable to source adequate organic feed and forage, they will not be able to produce organic milk.It is important to point out that concerns with GE alfalfa contamination are not just related to the organic industry. Conventional alfalfa growers rely heavily on the export market and have real reason to worry about those markets drying up if GE alfalfa is deregulated. According to the Foreign Agriculture Service at USDA, conventional alfalfa producers could lose at least $197 million in alfalfa seed and forage exports as a result of GE alfalfa deregulation. The largest alfalfa export markets are to GE sensitive countries, which have restrictions against importing GE contaminated crops. Further, Roundup is often used to kill stands between growing seasons, and Roundup tolerant seeds would lead to conventional growers using larger quantities of more expensive pesticides. You can be sure that I will continue to stand up for the organic industry. I appreciate you contacting me and I encourage you to be in touch in the future. ABC Reports: "Crop Safety A Little Seedy"
What you didn't know about fluoride in your water may shock you! Did you know fluoride comes from industrial waste? Don't Forget to Vote Today! Where does your candidate stand on GMOs? "I think the more we engineered things we put in our food the worse it is for us. I think each school system should buy local, if possible and at least state wide local. I think our state government should... only buy local. Give me a call if you would like to talk." Mr. Chambliss responded to our inquiry. He, on the other hand, is pro-gmo and does not support mandatory labeling of gmo foods. We find this very discouraging. *We know GM crops have NOT been thoroughly tested before entering human food supply, and we have evidence showing the dangers of these crops. Unfortunately, we cannot rely on some of our current elected officials to look out for our best interests and must commit to supporting and electing leaders who will. GMOs Contaminate Crops Worldwide - Organic Farmers Penalized! America's rice farmers didn't want to grow a genetically engineered crop. Their customers in Europe did not want to buy it. So how did it end up in our food? Fortune's Marc Gunther reports. (Fortune Magazine) -- Back in the spring of 2001, a 64-year-old Texas rice farmer named Jacko Garrett watched a fleet of 18-wheelers haul away truckloads of rice that he had grown with great care. "It just bothers me so bad," Garrett said. "I'm sitting here trying to find food to feed people, and I've got to bury five million pounds of rice." No one likes to waste food, but for Garrett, who runs a charity that collects rice for the needy, the pain was especially acute. Garrett's rice was genetically modified, part of an experiment that was brought to an abrupt halt by its sponsor, a North Carolina-based biotechnology company called Aventis Crop Science. The company had contracted with a handful of farmers to grow the rice, which was known as Liberty Link because its genes had been altered to resist a weed killer called Liberty, also made by Aventis. But by 2001, Aventis Crop Science was living a biotech nightmare. Another one of its creations, a variety of genetically modified corn known as StarLink, had been discovered in taco shells made by Kraft. 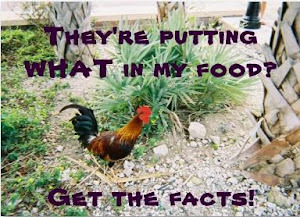 Because the StarLink corn had been approved as animal feed - and not for human consumption - all hell broke loose. Hundreds of corn products were recalled. Consumers and farmers sued. Greenpeace dumped bags of corn in front of federal regulatory agencies, and an Environmental Protection Agency official accused Aventis Crop Science of breaking the law. So shell-shocked was Aventis SA (Charts), the French pharmaceutical giant that owned Aventis Crop Science, that it decided to sell the U.S. biotech unit and abandon the very emotional business of reengineering the foods we eat. So dumping the Texas rice was a no-brainer. "We didn't want to take any chances," says a former Aventis executive. "We burned and buried enough rice to feed 20 million people." Eventually Aventis paid about $120 million to settle the StarLink lawsuits. It sold its crop science unit to Bayer (Charts), the German drug giant that makes aspirin, Aleve and Alka-Seltzer. Bayer Crop Science dropped plans to bring Liberty Link rice to market, largely because rice grown in the U.S. is exported to Europe and other places that don't want genetically modified foods. And everyone forgot about Jacko Garrett's rice. Can you guess where this is going? Yep. In January 2006, small amounts of genetically engineered rice turned up in a shipment that was tested - we don't know why - by a French customer of Riceland Foods, a big rice mill based in Stuttgart, Ark. Because no transgenic rice is grown commercially in the U.S., the people at Riceland were stunned. At first they figured that the test was a mistake or that tiny bits of genetically modified corn or soybeans had somehow gotten mixed up with rice during shipping. They said nothing. Then came another shock. Testing revealed that the genetically modified rice contained a strain of Liberty Link that had not been approved for human consumption. What's more, trace amounts of the Liberty Link had mysteriously made their way into the commercial rice supply in all five of the Southern states where long-grain rice is grown: Arkansas, Texas, Louisiana, Mississippi and Missouri. Bayer and Riceland then informed the U.S. Department of Agriculture, which announced the contamination last August. Last November, over the howls of anti-GMO (that's genetically modified organisms) activists, the USDA retroactively approved the Liberty Link rice, known as LL601. The department said the genes that it approved are similar to those inserted for years into canola and corn, with no apparent ill effects. The experts at the USDA, the EPA and the Food and Drug Administration, all of which bear some responsibility for regulating transgenic food, say the contamination is nothing to worry about. Then again, the experts also have dismissed repeated warnings that genetically modified crops can't be managed or controlled. When organic farmers worried that their fields could be invaded by genetically modified plants grown nearby, regulators told them there was nothing to fear. The biotech industry promised that experimental, gene-altered plants could be grown in open fields and never, ever end up in the neighborhood Safeway. In any event, after last year's contamination became public, and after rice prices took a tumble, and after Europe said it no longer wanted any American rice, and after several other countries, including Japan and Iraq (! ), demanded rigorous testing of U.S. rice, the industry moved to contain the damage. Rice growers were told not to plant Cheniere, a popular seed variety that had been tainted by Liberty Link genes. Regulators set up a comprehensive testing program to keep future harvests clean. Last December, Bruce Knight, a USDA official, assured worried rice farmers, "The good news is that the only foundation seed to test positive for Liberty Link was of a single variety - 2003 Cheniere." And then ... the tests that had been put in place uncovered a second contamination, and then a third, involving new, unapproved strains of Liberty Link, which turned up in another popular variety of rice seed, called Clearfield 131 (CL131). This seed variety is made by the German chemical giant BASF Corp. So the CL131 seed had to be banned as well. Yes, it's the attack of the mutant rice, and it's spreading. "This is a new kind of pollution," says Andrew Kimbrell, director of a Washington advocacy group called the Center for Food Safety, which opposes transgenic food. "You don't see it. It disseminates. It reproduces. It mutates. It's living pollution." And here's the thing that really bugs many of America's 8,000 rice farmers: They didn't want to grow transgenic rice. It's not that they object to genetic engineering per se; many of them grow transgenic corn or soybeans alongside their conventional rice. Over the past decade, in fact, biotech crops have become staples of the American diet; about 60 to 70 percent of the processed foods in U.S. grocery stores contains oils or ingredients derived from biotech corn and soybeans, according to BIO, an industry group. Nevertheless, an acrimonious debate about whether biotech food is safe for the environment and human health rages on amid considerable scientific uncertainty. Absent firm proof of danger, regulators in the U.S. have chosen to permit widespread bioengineering. But rice farmers know their market. About half of the U.S. rice crop, which was worth about $1.9 billion last year, is exported, and Europeans and Asian consumers simply don't want genetically engineered food. "If I can't sell it, I don't want to grow it," says Jennifer James, who grows rice, wheat and soybeans, some of them transgenic, on a 7,500-acre farm near Newport, Ark. Some farmers point the finger at environmental groups like Greenpeace for scaring people with their talk of Frankenfoods. Says James, who has decided not to sue: "Somebody screwed up somewhere." Collectively, farmers and seed companies have lost hundreds of millions of dollars as a result of the contamination. Its origins remain a mystery. "This is the most traumatic thing I've seen in the rice industry in 30 years," says Darryl Little, the widely respected director of the Arkansas State Plant Board, who has tried to clean up the mess. "It's been devastating." And not just to the farmers. Consider the plight of Scott Deeter, the chief executive of a Sacramento biotech firm called Ventria Bioscience. Ventria wants to grow rice that has been genetically engineered to produce proteins that can then be extracted and turned into low-cost treatments for diarrhea. Making the drugs by growing transgenic rice is cheaper than producing them in a lab. "The rice plant is just the factory," Deeter says. Ventria's medicine would save lives, Deeter says. About 1.8 million children in poor countries die annually from diarrhea. The disease raises national security issues as well, Deeter told a congressional subcommittee. "During Operation Iraqi Freedom, 70 percent of deployed troops suffered a diarrheal attack," he testified. "This is a silent enemy attacking American troops." Even before the Liberty Link brouhaha, Ventria struggled to find a home for its "pharma rice." California told the company not to grow it in the state after farmers objected. So did Missouri, after Anheuser-Busch threatened to stop buying Missouri rice if Ventria was allowed to grow there. (AB did not want diarrhea-fighting proteins to turn up in a Bud.) Last year Deeter took his plans for rice fields and a production plant to Junction City, a small Kansas town more than 200 miles away from the nearest rice farm. That's not far enough to satisfy critics. The USA Rice Federation, an industry group, opposed Ventria's plans. Citing Liberty Link, the group said it does not believe that the USDA can protect "the environment and the public's food and feed supply from unwanted intrusions of genetically engineered materials." "We're not anti-biotech, and we're not anti-Ventria," says Bob Cummings, the federation's senior vice president. "Our job is to protect our industry." "HAVE A RICE DAY." So says the USA Rice Federation, which wants people to eat more rice. Check out the recipes on its Web site for Senegalese peanut soup with spicy rice timbales; walnut rice with cream cheese, mushrooms and spinach; and chocolate-chip banana nut rice pudding. Yum. Alas, these items are not on the menu at the Little Chef restaurant in Stuttgart, Ark., where Fortune and a group of rice growers recently discussed the industry's woes over a lunch of chicken-fried steak, vegetables and you-know-what. Arkansas grows about 45 percent of the nation's rice crop, and America's two biggest rice mills, Riceland Foods and Producer's Rice Mill, are headquartered in Stuttgart, a town of 10,000 people that bills itself as the Rice and Duck Capital of the World. Rice plants and ducks both like water. Although they can't prove it, the farmers believe that rice prices are lower than they would be because of the Liberty Link problems. After the contamination was made public by the USDA on Aug. 18, 2006, the price of rice futures fell by about 10 percent. Prices have recovered since then, but farmers say they should be higher given the rising prices for other farm commodities. Currently, rough (meaning unrefined) rice sells for about $10.70 per hundredweight, or 100 pounds. "Rice could have been $1 a hundredweight more, and every farmer needs that," says Ray Vester, who farms about 1,300 acres in Stuttgart and sits on the state plant board. Rice farmers have been hard hit by rising energy and fertilizer costs, so they are feeling squeezed. Farmers who planned to use either Cheniere or CL131 seed had an additional problem. They had to scramble to find alternatives or plant other crops. About 40 percent of the rice acreage in Arkansas would have been planted with either Cheniere or CL131 until both were banned, according to Chuck Wilson, a rice specialist with the University of Arkansas cooperative extension service in Stuttgart. Wilson expects Arkansas growers to plant 1.2 million acres of rice this year, 13 percent less than last year and the lowest acreage since 1996. Hardest hit was a small group of farmers who specialize in growing rice for seed and were unable to sell their stocks of Cheniere or CL131 to other farmers. "We had to put seals on the bins. We couldn't ship it. We couldn't plant it," said Troy Hornbeck, an owner of HBK Seed in Dewitt, Ark. He was eventually permitted to sell the transgenic rice for consumption, not for planting, at a loss. Ten seed dealers from Arkansas, Missouri and Louisiana recently sued Bayer, saying the company's carelessness ruined their seed. Rival BASF, which lost an estimated $15 million because it owns the banned Clearfield 131 variety, hasn't said whether it will sue, but its executives are unhappy. "We can't have an unwanted GM event floating around the seed supply," said one. Many other lawsuits have been filed. Tilda, a British importer of rice, has sued Bayer Crop Science, Riceland Foods and Producer's Rice Mill, saying it had to destroy or send back Arkansas rice. A Chicago tort lawyer named Adam Levitt has been named a lead counsel in a federal lawsuit brought on behalf of more than 400 rice growers. Not by coincidence, Levitt represented corn farmers who successfully sued Aventis Crop Science, Bayer's predecessor, over StarLink. Says Levitt: "Bayer knew Liberty Link rice could easily contaminate the rice supply, because Bayer contaminated the U.S. corn supply only a few years ago." Bayer says the company complied fully with the law. In a legal filing, its lawyers speculated that the alleged damages were caused by an "act of God." So it's God's fault? That's about as good an answer as we've got right now to the question of what went wrong. The USDA's Animal Plant and Health Inspection Service (APHIS) has been investigating since last summer, but the agency won't say what it has learned. In a sense, APHIS is investigating itself. Its track record, frankly, is a little scary. In 2005 the USDA's inspector general said that APHIS, which regulates field tests of biotech foods, didn't know the location of some field trials, did no independent testing of nearby crops and did not even require submission of written protocols by some biotech firms, leaving the industry to, in effect, monitor itself. The audit concluded: "APHIS' current regulations, policies and procedures do not go far enough to ensure the safe introduction of agricultural biotechnology." APHIS says it has fixed the problems. "We regulate technology that's constantly changing, and our policies continue to evolve," John Turner, an agency official, told Fortune. As it turns out, it's unlikely that Jacko Garrett's Texas rice escaped from the landfill to live another day. He grew a different variety of Liberty Link from the one that got into the Cheniere seed. Instead, the source of the contamination is probably a rice research station in Crowley, La., operated by Louisiana State University. The LSU fields appear to be among the very few places - if not the only one - where the Liberty Link rice was grown in proximity to fields where Cheniere and CL131 seeds were also being developed. The LSU rice-breeding station is run by a man named Steve Linscombe, one of the most admired men in the U.S. rice industry. Linscombe, who is 52, has devoted his entire career to developing rice-seed varieties that improve yields and resist pests or herbicides. "He has put millions of dollars into the pockets of rice farmers," says Darryl Little, the Arkansas regulator. "He's a premier breeder." Because Linscombe understood the risks of mixing transgenic rice seed with conventional varieties, he took extra precautions when working with Liberty Link. To prevent pollen or stray kernels of rice from migrating, USDA rules recommend at least a ten-foot buffer zone around transgenic field tests. LSU's contract with Bayer called for a 30-foot isolation zone. Linscombe created buffer zones of at least 120 feet. Until now, no one thought rice pollen could travel that far. "I did as much isolation as I possibly could," Linscombe said. So what happened? "I have been dealing with this for nine months, and I still can't give you a definitive answer," he said. Wilson, the University of Arkansas rice specialist, says, "I think we've learned some things about rice, biologically, that we didn't know before." Whether the USDA has learned is another question. In May the agency granted Ventria's application to grow its pharma rice on up to 3,200 acres in Kansas. The agency had received 20,000 comments (most by e-mail clicks) opposing the plan from citizens, activists, farmers and rice industry groups. Deeter, Ventria's CEO, says there's no chance that the pharma rice will find its way into the food supply, as Liberty Link did: "We're more strictly regulated, by a factor of ten - not for any good reason, by the way." In the USDA ruling, Rebecca Bech, an APHIS administrator, wrote, "The combination of isolation distance, production practices, and rice biology make it extremely unlikely that this rice would impact the U.S. commercial rice supply." In other words, there's nothing - nothing at all - to fear. Window Farms Project - Think Outside the Box! This is a really cool way to grow your own food indoors and could probably be done just about anywhere in the world and potentially solve the "world food hunger" issue - WITHOUT GENETICALLY ENGINEERED FOOD! Interview with Robert F. Kennedy, Jr. reveals explosive cover up by FDA and the relationship between thermerasol in vaccines and autism in children. Note the surge in autism cases after the FDA gave the green light in 1989 for increased usage of these vaccines. It is becoming more evident the FDA has been reluctant in recent years to cooperate in removing this dangerous ingredient from vaccines or admit the autism connection in an effort to cover their tracks at the expense of children! Report on Agave - Is It Good or Bad For You? There are some very confusing reports and opinions on the health effects of agave as a sweetner lately. Many nutrionists claim agave is the way to go while one of our most respected resources will advise caution when considering agave. For a detailed explanation on these findings, the following report from the owner of Gnosis Chocolate describes how most forms of agave are potentially worse than high fructose corn syrup, but when processed correctly, agave can be a great alternative to sugar and other sweetners. *Disclaimer - This site does not receive compensation from either resource mentioned in these reports. We respect the opinions of both Dr. Mercola, (osteopathetic physician and best-selling author) and Vanessa Barg (President and Raw Chocolatier of Gnosis Chocolate). Our intent is to provide informative resources for you to make an educated and informed choice in your health and nutrition - especially in an effort to avoid genetically modified organisms. A study published in the International Journal of Biological Sciences demonstrates the toxicity of three genetically modified corn varieties from the American seed company Monsanto, the Committee for Independent Research and Information on Genetic Engineering (Criigen, based in Caen), which participated in that study, announced Friday, December 11 . "For the first time in the world, we've proven that GMO are neither sufficiently healthy nor proper to be commercialized. [...] Each time, for all three GMOs, the kidneys and liver, which are the main organs that react to a chemical food poisoning, had problems," indicated Gilles-Eric Séralini, an expert member of the Commission for Biotechnology Reevaluation, created by the EU in 2008. Caen and Rouen University researchers, as well as Criigen researchers, based their analyses on the data supplied by Monsanto to health authorities to obtain the green light for commercialization, but they draw different conclusions after new statistical calculations. According to Professor Séralini, the health authorities based themselves on a reading of the conclusions Monsanto has presented and not on conclusions drawn from the totality of the data. The researchers were able to obtain complete documentation following a legal decision. "Monsanto's tests, effected over 90 days, are obviously not of sufficient duration to be able to say whether chronic illnesses are caused. That's why we ask for tests over a period of at least two years," explained one researcher. Consequently, the scientists demand a "firm prohibition" on the importation and cultivation of these GMOs. 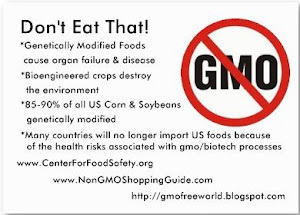 Good resourse explaining GMOs in a nutshell - for those new to the GMO Free movement: http://www.raw-wisdom.com/50harmful. This article from December sheds some light on GMO's next target - the wheat industry. Some wheat growers aren't taking this lying down! Buttons now available to share your message! If you are like some of us who have to improvise from time to time, like when we don't have a working oven, you may find yourself cooking some things on the stove top or electric skillet. 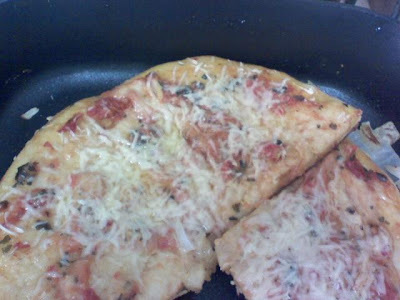 However, when making skillet pizza, as I like to call it, you may find yourself facing the dilemma of how to keep the crust from burning while the rest of the pizza gets good and done. 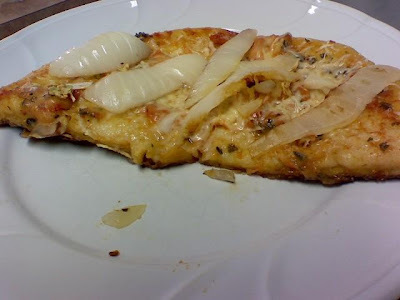 Here is a little trick I thought of at the last minute today when I decided to add some fresh onions and garlic... After your pizza has been in the skillet long enough for the bottom of the crust to turn a light, golden brown, remove the pizza for a moment, place a layer of thickly-sliced onions in the bottom of the skillet, and place the pizza back in the skillet on top of the onions. The onions will serve as an edible cooking rack and can be used as a topping when done. Now, cover the pizza with a lid to keep the heat in and continue cooking until toppings are melted and crust is done. *Side Note: Of course, at times, you may find yourself too busy to deal with making a pizza entirely from scratch. 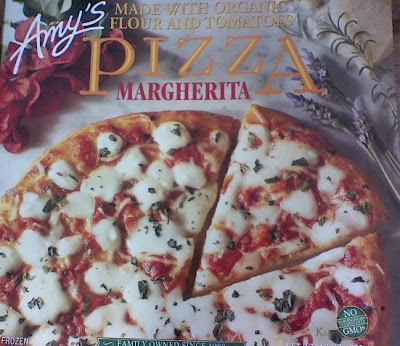 If you MUST opt for a frozen pizza, Amy's is one that is GMO-Free! (Notice the little green logo on the front of the box?! This is the kind of thing you want to look for when shopping for any packaged GMO-Free foods in the grocery store.) The above pizza is Amy's Margherita Style pizza. I personally like a thinner crust, especially if making pizza on the stove top or in an electric skillet. But it's nice to know we have healthy options. We can boycott Mars, M&M, Hershey, but they still find ways to get that junk into our food supply. If they don't sell the candy, they use it as cow fodder. This GM conspiracy monster must be stopped and NOW! Interesting video on the chicken industry. "Investers should cut their losses...."
This was posted a little while back... thought you might like to see the side effects of GM Soy in 2nd generation off-spring (in this case, hampsters, with hair growing inside their mouths by the teeth! "This study was just routine," said Russian biologist Alexey V. Surov, in what could end up as the understatement of this century. Surov and his colleagues set out to discover if Monsanto's genetically modified (GM) soy, grown on 91% of US soybean fields, leads to problems in growth or reproduction. What he discovered may uproot a multi-billion dollar industry. After feeding hamsters for two years over three generations, those on the GM diet, and especially the group on the maximum GM soy diet, showed devastating results. By the third generation, most GM soy-fed hamsters lost the ability to have babies. They also suffered slower growth, and a high mortality rate among the pups. And if this isn't shocking enough, some in the third generation even had hair growing inside their mouths—a phenomenon rarely seen, but apparently more prevalent among hamsters eating GM soy. The study, jointly conducted by Surov's Institute of Ecology and Evolution of the Russian Academy of Sciences and the National Association for Gene Security, is expected to be published in three months (July 2010)—so the technical details will have to wait. But Surov sketched out the basic set up for me in an email. He used Campbell hamsters, with a fast reproduction rate, divided into 4 groups. All were fed a normal diet, but one was without any soy, another had non-GM soy, a third used GM soy, and a fourth contained higher amounts of GM soy. They used 5 pairs of hamsters per group, each of which produced 7-8 litters, totally 140 animals. "Originally, everything went smoothly. However, we noticed quite a serious effect when we selected new pairs from their cubs and continued to feed them as before. These pairs' growth rate was slower and reached their sexual maturity slowly." He selected new pairs from each group, which generated another 39 litters. There were 52 pups born to the control group and 78 to the non-GM soy group. In the GM soy group, however, only 40 pups were born. And of these, 25% died. This was a fivefold higher death rate than the 5% seen among the controls. Of the hamsters that ate high GM soy content, only a single female hamster gave birth. She had 16 pups; about 20% died. Surov said "The low numbers in F2 [third generation] showed that many animals were sterile." The published paper will also include measurements of organ size for the third generation animals, including testes, spleen, uterus, etc. And if the team can raise sufficient funds, they will also analyze hormone levels in collected blood samples. Earlier this year, Surov co-authored a paper in Doklady Biological Sciences showing that in rare instances, hair grows inside recessed pouches in the mouths of hamsters. "Some of these pouches contained single hairs; others, thick bundles of colorless or pigmented hairs reaching as high as the chewing surface of the teeth. Sometimes, the tooth row was surrounded with a regular brush of hair bundles on both sides. The hairs grew vertically and had sharp ends, often covered with lumps of a mucous." From A. S. Baranov, O. F. Chernova, N. Yu. 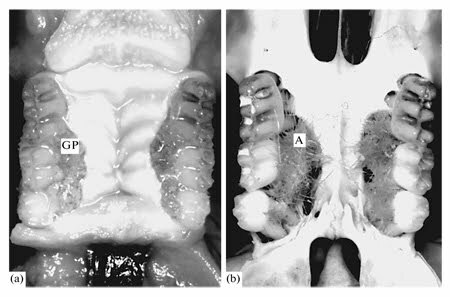 Feoktistova, and A. V. Surov, “A New Example of Ectopia: Oral Hair in Some Rodent Species,” Doklady Biological Sciences, 2010, Vol. 431, pp. 117–120, Original Russian Text © A.S. Baranov, O.F. Chernova, N.Yu. Feoktistova, A.V. Surov, 2010, published in Doklady Akademii Nauk, 2010, Vol. 431, No. 4, pp. 559–562. At the conclusion of the study, the authors surmise that such an astounding defect may be due to the diet of hamsters raised in the laboratory. They write, "This pathology may be exacerbated by elements of the food that are absent in natural food, such as genetically modified (GM) ingredients (GM soybean or maize meal) or contaminants (pesticides, mycotoxins, heavy metals, etc.)." Indeed, the number of hairy mouthed hamsters was much higher among the third generation of GM soy fed animals than anywhere Surov had seen before. Surov warns against jumping to early conclusions. He said, "It is quite possible that the GMO does not cause these effects by itself." Surov wants to make the analysis of the feed components a priority, to discover just what is causing the effect and how. In addition to the GMOs, it could be contaminants, he said, or higher herbicide residues, such as Roundup. There is in fact much higher levels of Roundup on these beans; they're called "Roundup Ready." Bacterial genes are forced into their DNA so that the plants can tolerate Monsanto's Roundup herbicide. Therefore, GM soy always carries the double threat of higher herbicide content, couple with any side effects of genetic engineering. Rats photo #1Surov's hamsters are just the latest animals to suffer from reproductive disorders after consuming GMOs. In 2005, Irina Ermakova, also with the Russian National Academy of Sciences, reported that more than half the babies from mother rats fed GM soy died within three weeks. This was also five times higher than the 10% death rate of the non-GMO soy group. The babies in the GM group were also smaller (see photo) and could not reproduce. In a telling coincidence, after Ermakova's feeding trials, her laboratory started feeding all the rats in the facility a commercial rat chow using GM soy. Within two months, the infant mortality facility-wide reached 55%. When Ermakova fed male rats GM soy, their testicles changed from the normal pink to dark blue! Italian scientists similarly found changes in mice testes (PDF), including damaged young sperm cells. Furthermore, the DNA of embryos from parent mice fed GM soy functioned differently. An Austrian government study published in November 2008 showed that the more GM corn was fed to mice, the fewer the babies they had (PDF), and the smaller the babies were. Central Iowa Farmer Jerry Rosman also had trouble with pigs and cows becoming sterile. Some of his pigs even had false pregnancies or gave birth to bags of water. After months of investigations and testing, he finally traced the problem to GM corn feed. Every time a newspaper, magazine, or TV show reported Jerry's problems, he would receive calls from more farmers complaining of livestock sterility on their farm, linked to GM corn. Researchers at Baylor College of Medicine accidentally discovered that rats raised on corncob bedding "neither breed nor exhibit reproductive behavior." Tests on the corn material revealed two compounds that stopped the sexual cycle in females "at concentrations approximately two-hundredfold lower than classical phytoestrogens." One compound also curtailed male sexual behavior and both substances contributed to the growth of breast and prostate cancer cell cultures. Researchers found that the amount of the substances varied with GM corn varieties. The crushed corncob used at Baylor was likely shipped from central Iowa, near the farm of Jerry Rosman and others complaining of sterile livestock. In Haryana, India, a team of investigating veterinarians report that buffalo consuming GM cottonseed suffer from infertility, as well as frequent abortions, premature deliveries, and prolapsed uteruses. Many adult and young buffalo have also died mysteriously. Scientists who discover adverse findings from GMOs are regularly attacked, ridiculed, denied funding, and even fired. When Ermakova reported the high infant mortality among GM soy fed offspring, for example, she appealed to the scientific community to repeat and verify her preliminary results. She also sought additional funds to analyze preserved organs. Instead, she was attacked and vilified. Samples were stolen from her lab, papers were burnt on her desk, and she said that her boss, under pressure from his boss, told her to stop doing any more GMO research. No one has yet repeated Ermakova's simple, inexpensive studies. In an attempt to offer her sympathy, one of her colleagues suggested that maybe the GM soy will solve the over population problem! Surov reports that so far, he has not been under any pressure. Without detailed tests, no one can pinpoint exactly what is causing the reproductive travesties in Russian hamsters and rats, Italian and Austrian mice, and livestock in India and America. And we can only speculate about the relationship between the introduction of genetically modified foods in 1996, and the corresponding upsurge in low birth weight babies, infertility, and other problems among the US population. But many scientists, physicians, and concerned citizens don't think that the public should remain the lab animals for the biotech industry's massive uncontrolled experiment. Alexey Surov says, "We have no right to use GMOs until we understand the possible adverse effects, not only to ourselves but to future generations as well. We definitely need fully detailed studies to clarify this. Any type of contamination has to be tested before we consume it, and GMO is just one of them."